We haven't had a pork recipe for awhile and this one sounded too good to pass up. It combines so many good things and even the taste of Ranch (which might be a seller by itself for some). We know we will be making this up this weekend, looks so good. -Preheat oven to 400 degrees F. Lightly oil a baking sheet or coat with nonstick spray. 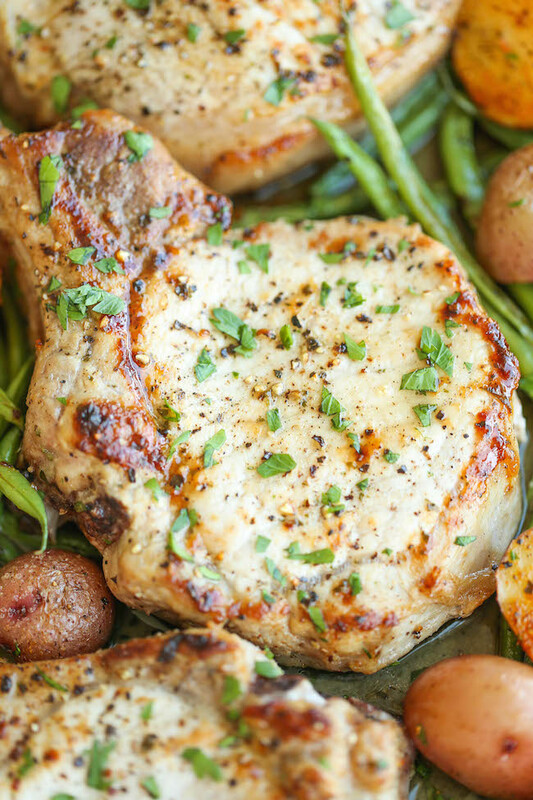 -Place pork chops, potatoes and green beans in a single layer onto the prepared baking sheet. Drizzle with olive oil and sprinkle with Ranch Seasoning and garlic; season with salt and pepper, to taste. -Place into even and roast until the pork is completely cooked through, reaching an internal temperature of 140 degrees F, about 20-22 minutes. * Then broil for 2-3 minutes, or until caramelized and slightly charred.